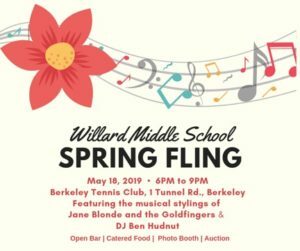 Join us for an elegant night out to benefit our Willard kids! From Karaoke to BBQ, the opportunity to sign up for intimate parties thrown by your fellow middle school parents. Strengthen your community ties and have a blast! We also offer a limited number of pay-what-you-will spots. Chose any amount from $0 up! Teachers are our guests (register here or on event website). Donate to the Willard Fund Today!